How do I enable Recycle Bin for the encrypted files? Generate a unique GUID for each Cryptomator vault. RelativePath - substitute the letter of your drive here. Deleted files are moved into the $RECYCLE.BIN folder on the same drive so they will still be encrypted. First open Registry Editor by pressing Windows + R, then type regedit and press enter. I am not really familiar with computer commands. Should I create those and how in details with size of the Bin ? I have 2 vaults/drives (Z:) (Y:) I would like recycle bin enabled. Modified some parts of the guide and added a batch script, which you can use to automatically enable the Recycle Bin. You only have to enter the drive name of the vault (in your case, fist run Z:\ , second run Y:\ ) and the max capacity of the Recycle Bin (in decimal). Replace the 9147E464-33A6-48E2-A3C9-361EFD417DEF with a GUID generated from the tool linked in the guide above. Then create the entries with your generated GUID, insert the values from the guide and you’re done. I runned the batch script and I think I did it fine. I erase 1 file in each vault to test but I cannot find the Bin in any of the vault. I copied it from the link above, changed some parts and tested it and it worked, but can not explain why it worked because the code contains directly after getting the MaxCapacity from the console, errors. The good and the bad is that the script has done nothing…sorry for that . Please try again to use the manual mode. We are discussing to integrate an “Windows-Recycle-Bin-enabler” directly into Cryptomator…well see, maybe there is in the future a button to handle that . I think I did it right, looks like what you show but still can’t find any recycle bin … Wait for better improvement. Thank you? Bin is of great value. Hey, you said, you’ve created a batch file. Could you publish it again? "but still can’t find any recycle bin "
Merci pour la réponse but I did not find a way to enable the bin. Do you mean it is possible now to have a bin in a vault ? I am not an expert, I simply followed the steps described in the Discussion, decribed by mkatsevVR. I can see my File name and I can identify the original Driver and most of it, I can restore it ! P.S: as a new user, I can only post a single Screen shoot, I’ll combine all of the in one. I think I am stuck with first step. There is no recyclebin in my vault, not before I delete a file, no after deleting a file. Question is, how did you enable the recycle bin ? I tried again manual step by step process to enable recycle bin but nothing happens but worse it blocked some stuff in windows settings and I could not rename folders after fulfilling the steps. Fortunately I could reverse and erase what was created through the steps. It is frustrating and a real problem not to have recyclebin enabled to avoid erasing files for ever. Would be cool if the trash would be as an extra function for Cryptomator implemented. Which could be enabled with a simple option. I am now testing cryptomator 1.4 Beta2. 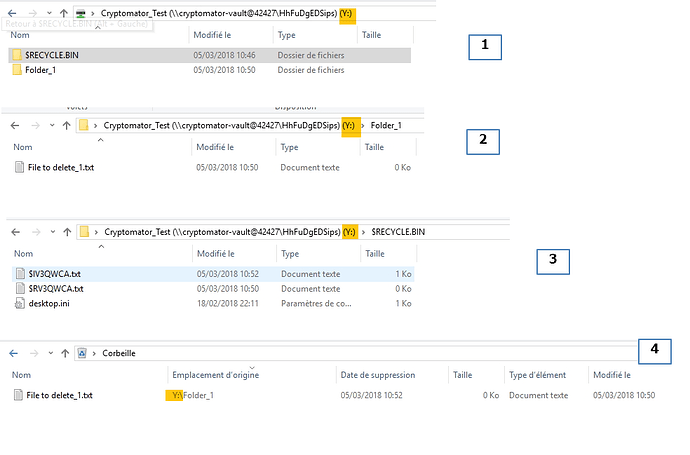 Previously I have setup a Recylce Bin using WebDav connection, but now using cryptomator 1.4 Beta2 I can not get the Recylcle Bin to work, using either FUSE or DOKANY. Is it or will it be supported with FUSE or DOKANY connection? I really like to having a small Recylcle Bin just to catch some accidental deletes which occur every now again. Under ubuntu, you already have a built in recycle bin (the .Trash directory). I dunno the situation under other linux distros. For windows, the the dokany project (which cryptomator is using for mounting the vault) has an option for an recycle bin, but currently it is deactivated because it causes some problems. Maybe in the future it is included as an option. Until then under windows you have to stick with WebDAV or find some way other neat trick to get it working. Thanks for this step by step details.